The Sylvan Path will have 5 main elements and a few "accessories" that we'll keep to our selves. Paths will be formed by lack of noodles and also by other means we are saving a surprise for participants The primary path will be curving and delineated by a lack of "trees," although there will be surprises that the participant will need to navigate around. 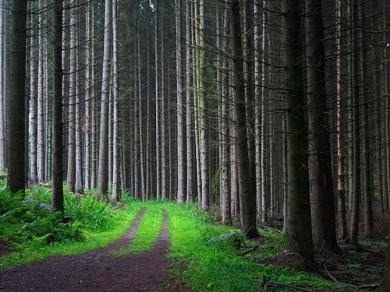 Sound: A number of small speakers putting out ambient sounds to help it all feel like a forest. Lighting: TBD, but under consideration are LED lights covering the entire top of the structure to act as "stars"
MILESTONE SUCCESSFULLY PASSED: The frame was tested at the 2013 Burning Man festival as the shade structure for Deviant Playground. The frame proved reliable and easy to assemble. MILESTONE SUCCESSFULLY PASSED: A deal has been secured with a manufacture to make the "trees". An entire shipping container will be headed our way in a month or so. MILESTONE SUCCESSFULLY PASSED: A tree design was settled on and 1/4 of them made. The frame design was finalized and 1/4 competed. In time for our large fundraising party. MILESTONE SUCCESSFULLY PASSED: Fundraising party was a success and we left the one section up for close to a month as a long term test. No real problems. MILESTONE SUCCESSFULLY PASSED: Full frame setup and 1800 "trees" setup at the Saguaro Man regional. Some design changes made due to this test in order to make it a little easier to setup. Also the addition of a trash fence like material around the outside is likely as it prevents fast running and bikes.